Hosting everything from opera to film to theatre to live music, Eden Court also has a rich life as a space for performing arts classes (more than 60 run each week), offering lessons for dancers, actors and performers of all ages and abilities. 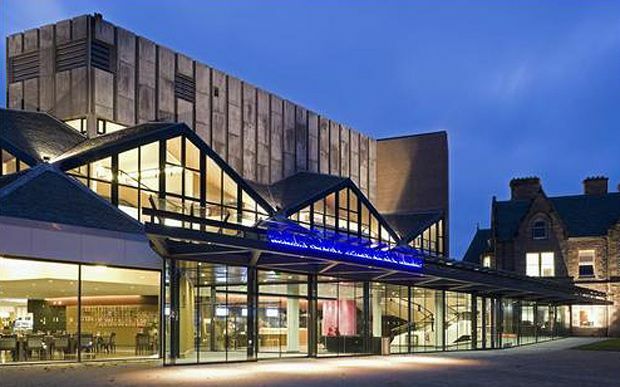 The multi-arts venue was built in the mid 70s, making it the largest scale venue in the region, with additional performance space – another theatre, two cinema screens, two dance and drama studios and three floors of dressing rooms – completed during a renovation in 2007. The building also houses the Eden Court Restaurant, which offers a lunch, dinner and bar menu. Character comedy from the Edinburgh Comedy Award winner. The youngest pupils of TFX Performing Arts Academy stage a show based on the tales of Hans Christian Andersen. Display of arts, crafts and food from across Scotland, where you can meet an array of craftspeople and purchase some unique goods. Formed in 1935, the BBC Scottish Symphony Orchestra is one of the UK's leading orchestras, with an exceptionally wide repertoire and a special affinity for contemporary music. The legendary comedian, author and playwright heads out on a stand-up tour for the first time in 15 years. Oh what a night you'll have at this tribute to Frankie Valli & the Four Seasons, with all the hits from 'Sherry' to 'Grease is the Word'. 'Unplugged' version of Vanishing Point's The Dark Carnival, featuring Biff Smith on acoustic guitar and narrator Robert Jack telling the story of the residents of Dickinsons Brae cemetery. A cycle sportive taking place around iconic Loch Ness, offering the chance to cycle 66 miles around the loch on traffic free roads. Young award-winning pianist with trio partners David Bowden (bass) and Stephen Henderson (drums). The best of Scottish food and drink, with producers exhibiting their wares. A feisty new hour about facing the future. Hear from adventure speakers and watch films from Kendal Mountain Festival. Musical comedy based on the Academy Award winning film Little Miss Sunshine, about a dysfunctional family travelling 800 miles in a old VW camper van to deliver their daughter to a children's beauty pageant. Pop icon, Bond singer and 1969 winner of the Eurovision Song Contest whose singing career spans six decades. Piping competition with more than 100 solo pipers across the world. TV comedy favourite Merton and his talented group of 'impro chums' (read: show offs) magically weave laughs from audience suggestions. Phill Jupitus talks about his relocation to Scotland and how that's going for him. Film festival in Dundee and Inverness that hosts a programme of feature-length documentaries addressing the motives and truths behind our global systems. Tribute to the classic 60s hits of the original summer of love. The students of TFX Performing Arts stage an evening of song and dance. Canadian comedian Tom Stade presents his show I Swear: comedy in which he pledges to tell the truth, the whole truth and nothing but the truth. So that's not going to happen, obviously. Cabaret as Australian actor/singer/songwriter Ruth Katerelos takes the audience on a musical journey through various states of love with Monique Kenny on guitar.